​Friends of the William Salt Library were formed to support the preservation of this unique library, which forms a vital part of Staffordshire’s heritage. The library consists of the William Salt Library Collection of historic manuscripts, books, maps and prints etc. Also the listed Georgian building which houses much of the collection. Together, they form a rare survival of such an historic library, which is of national interest. Through an annual programme of social events, the Friends raise funds to assist the Library in the ongoing task of preserving and conserving its collections and in the acquisition of new stock. Volunteers assist in the improvement of the Library’s finding aids and in the practical task of cleaning and repackaging items from the collections. If you would like to become a member then please contact the Treasurer for an application form. Annual subscription is £8 and life time membership costs £100. 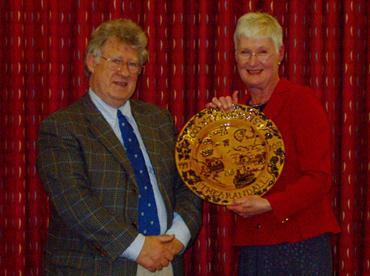 Staffordshire Heritage Group and Friends of the William Salt Library, presented retiring County Archivist Thea Randall with a large slipware charger, depicting scenes of Staffordshire and her dates in office. This was made by local Potter, Carole Glover. The photo shows Chairman of the Friends of the William Salt Library, David Jacques, presenting the charger. The Staffordshire Heritage Group would like to thank you all for your support in our long negotiations regarding our bid to save the William Salt Library building. Thanks to you and the hard work of many others, the building will now be part of the new History Centre. Discussions will continue for the next year or so to prepare for the second stage of the bid. We will endeavour to protect the identity of the Salt Library within the old building. I am delighted to inform you that the Heritage Lottery Fund considered Staffordshire County Council’s and William Salt Library’s application to fund the Staffordshire History Centre Project on 24 May and have agreed to award us a stage 1 pass. The proposed new centre has received nearly £4million from the Heritage Lottery Fund to create a two-storey link between the Staffordshire Record Office and the William Salt Library in Stafford. The new centre will hold records up to 1,000 years old, as well as having a new community exhibition space, modern search rooms and strong rooms to provide storage for an additional 25 years of future collections. The grant that Staffordshire County Council has been awarded of £4.29m which will be split into two phases, development phase and delivery phase. For the development phase we will receive £333,350. This funding will enable the development of the project to the stage 2 bid after which, if we are successful, we will begin the building work and delivery of activities. The competition was very fierce and so this is a really amazing achievement for the project. It reflects the amount of work, commitment and consultation that the Project Board, Project team and partners have put in to ensure that our new bid was exciting, inspiring, robust, and sustainable. I would like to take this opportunity to thank you all for helping us to secure this successful outcome, your input in helping to shape the bid was invaluable. This public consultation follows on from the regular meetings of a stakeholder group to develop a ‘Vision’ for the Heritage and Archives Service, including the William Salt Library. Nine options were discussed by stakeholders with reference to the need to improve storage conditions at Lichfield Record Office and the William Salt Library and for the service to comply with Archives Accreditation standards. Also in the context of required budget savings. Four options ( A, B, C, and D) have been put forward for consultation. We welcome your thoughts on the options by taking part in the consultation survey, (see below). Please read my Annual Report, which follows this note. Perhaps you have heard of our campaign on behalf of the William Salt Library. It is not to keep the collections in the present building at all costs, as some detractors have claimed; we have accepted that the building is not suitable in the long term for document or book storage. However, as the public consultation exercise in January demonstrated, many users of the library object to the County Council’s proposals on various grounds. One concern is that in the new arrangements the library, which is unique as a trust-run topographical library open to the public, and something for Staffordshire to be proud of, loses its identity as it will be completely absorbed into the County Council collections. Second, most of the book collection will no longer be on open access. Third, neither the trustees nor the County Council appear to have the slightest idea of what will become of the present building. In our view, because it has been the home of the library for 100 years, and is the reason why the records office is where it is, it should be part of the solution. It can provide office space, meeting rooms and exhibition space and save considerable building costs. The Friends’ committee is willing to use funds and to raise more money to see the building refurbished. The Friends produced a plan, attached to this note, in order to demonstrate that there are alternatives to the rather insensitive proposals put forward by the County Council’s architects. It was offered to the trustees in February and they promised to have it assessed. Unfortunately they sent it to the very same architects whose plans we had found so unsatisfactory; no surprise, then, that the architects’ attitude was negative. We feel that neither the trustees nor the County Council have engaged with the Friends’ concerns or alternative ideas – they give the impression that it would be much better if we kept quiet. What has brought us to this point? We have asked since February 2013 to have some form of consultation with the Trustees. So far we have had two visits from them when they attended Friends committee meetings. The first one we thought we just might be on a positive track, as the Chairman of the Trustees listened to our proposals, as we submitted a plan to incorporate the old building with the new, (plan attached) and offered to help to raise the money to refurbish the old building. I am cynical enough to believe that this meeting was granted only due to the press coverage the Friends had been granted to fight for the old Library. The second meeting, was where a Trustee told us that our plans were rejected, without offering any other form of consultation. We have been denied access to the Library to do an evaluation of the cost of repair, and all our plans have had to be done by standing outside and evaluating! Over the last year proposals for the future of the William Salt Library have emerged. The Friends have opposed them, not because we are against change (for centralisation may well be of benefit to us users of archives and the library), but because the published proposals will lead to the identity of the Salt library and collections being obscured, and because the present building will be disposed of without any clear idea of its future, when it could have an important role in the future of the Archive Service. ‘We put an alternative to the Trustees in February in order to open a discussion, and they said they would consider it. In fact they passed it back to the architects of the scheme that we disliked; they adopted a negative and obtuse attitude and refused to acknowledge the good points of our alternative. A disinterested commentator would not have given the reply they did. The Trustees adhered to the architects. It turns out that the architects are part of the County Council architects department in disguise, and regularly get given work as if they were employees of the Council. ‘We are disappointed by the County Councillors who are behind this process. To them this is a cost-cutting exercise, and they do not wish to hear a complicated argument, nor ones about heritage or identity. They used their position to push their decision through, brushing aside objections like ours as if we were merely troublemakers. We are also disappointed by the Trustees of the William Salt Library who as a body have proved they are subservient to the wishes of the County Council and have demonstrated not the slightest degree of independent thinking. It is indeed a difficult time to be the Friends.